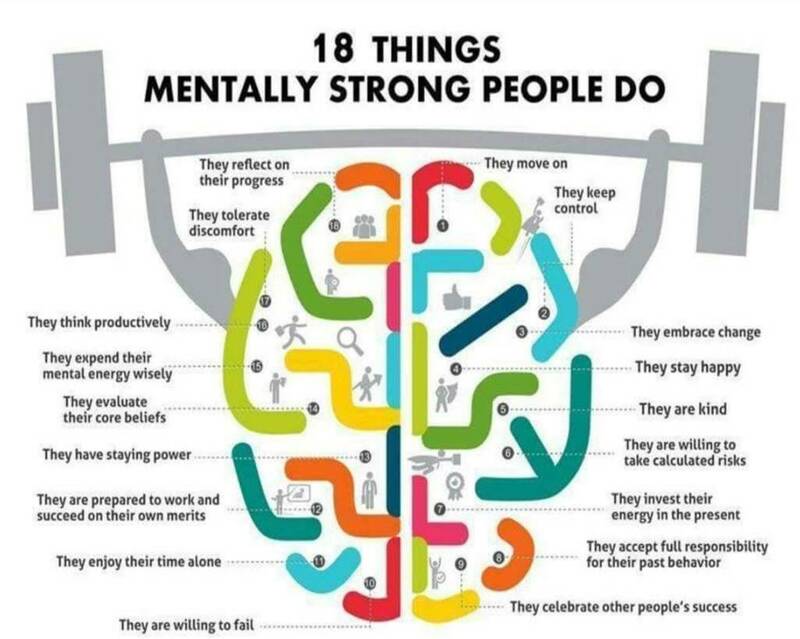 Some time ago I came upon a list of 18 Things Mentally Strong People Do with a wonderful graphic. While it was a great list, it did not give any advice on how to achieve these 18 Things. What I would like to do here is expound upon this list with some insight. While having a list is always good, reasons behind the list are usually better in getting a person to act and grow. As Amelia Earhart’s quote goes, “The most difficult thing is the decision to act. The rest is merely tenacity.” So, let’s all decide to act towards being a stronger, better person! I would put it more like they do not dwell on things that they cannot control. They fully understand their limits and realize when the return on effort nets zero (or something less than zero). As Helen Keller put it, “When one door of happiness closes, another opens; but often we look so long at the closed door that we do not see the one which has been opened for us.” Those people who are mentally tough see those new open doors. In addition to moving on, they just keep moving. “Sometimes life seems a dark tunnel with no light at the end, but if you just keep moving forward, you will end up in a better place.” They know life is going to give you a lot of setbacks, but to get past them; you have to get through them. Not so much keeping control of everything around them, but of themselves. “You may not control all the events that happen to you, but you can decide not to be reduced by them,” as Maya Angelou succinctly puts it. Self-control is the key to mastery of a mentally strong character. As Rumi states, “The intelligent want self-control; children want candy.” This quote is more salient that it appears as children tend to throw temper-tantrums when they do not get what they want. Mentally strong people are able to stay in control and look for other ways around the problem and ultimately come up with a plan get past it. Most people hate change. Why? Because it brings uncertainty and risk. Mentally strong people know that the only way to grow is to change and they understand that, “Progress is impossible without change, and those who cannot change their minds cannot change anything,” as George Bernard Shaw so eloquently put it. Mentally strong people understand that, as Winston Churchill put it, “To improve is to change; to be perfect is to change often.” This desire for self improvement is key to why they embrace change. This is a tough one for most people because they are often mistaken in believing that something will make them happy. Groucho Marx sums it best when he says, “I, not events, have the power to make me happy or unhappy today.” This can also be followed up with Martha Washington’s quote on happiness that is, “The greater part of our happiness or misery depends upon our dispositions, and not upon our circumstances.” So you kind of make yourself as happy as you want to be. And by kind, just not generous with their time and money, but genuinely thoughtful of other people, about how they feel, and always willing to lend a helping hand. Intelligently strong people seem to understand that life is much, much more than just being wrapped up in themselves and as Emerson said, “You cannot do a kindness too soon, for you never know how soon it will be too late.” Adding to the sentiment, Theodor Isaac Rubin says, “Kindness is more important than wisdom, and the recognition of this is the beginning of wisdom.” So, to be kind at a minimum is also to be wise. Oh what is life and living without some risk? Still, what separates mentally strong people from everyone else is the number and frequency of the risks they take. Leo Buscaglia says, “Risks must be taken, because the greatest hazard in life is to risk nothing.” Yes, this is true, but being reckless or foolish in risk taking is not the answer. As old blood and guts himself, George S. Patton, once mentioned, “Take calculated risks. That is quite different from being rash.” It is in calculated risks that mentally strong people excel. We all want to be happy, but most of us do not invest the time, today, in achieving that goal.. ever. “Happiness is not something you postpone for the future; it is something you design for the present,” as Jim Rohn declares. That means, you need to invest your energy in the present. Seneca says, “True happiness is to enjoy the present, without anxious dependence upon the future,” and for almost 2,000 years he has been correct. Nobel laureate and philosopher, Albert Camus understood the value of putting your energy in the present when he said, “Real generosity toward the future consists in giving all to what is present.” The future will come what may, and mentally strong people understand it will never come unless it finds you working today. As I like to say, “Do not let your past insecurities ruin your future victories.” I have met people who are so obsessed with past mistakes or hurts that they are literally frozen in their thinking and actions. If you want victory, accept what you did, take responsibility, learn from it and jettison that anchor around your neck. This is one of those things that you would not think mentally strong people would do, but as Helen Keller quoted, “The unselfish effort to bring cheer to others will be the beginning of a happier life for ourselves.” When you are envious of others’ success, it only makes you small and miserable. Adding to this is that mentally strong people not only are willing to fail, but see it as a conduit to their happiness for as Robert Louis Stevenson says, “Our business in life is not to succeed, but to continue to fail in good spirits.” While for most people failure is equated with defeat, Robert Kiyosaki believes that “Failure defeats losers, failure inspires winners.” Essentially, for mentally strong people, having a setback energies them to double down and get on with getting on. We all need alone time, and for many, being alone is not a pleasant experience. Many have the outward need to always be with someone or doing something. Essentially, they do not like having self reflection during “me-time.” As I say, “You will never be alone if you like the person you are with when you are by yourself.” Mentally strong people know that alone time is growth time; that you can recharge and reflect on strategies, successes, and living with less stress. In addition, mentally strong people know that sometimes doing it alone is the best way. As Diane Grant wrote, “It's better to walk alone, than with a crowd going in the wrong direction.” They do not waste mental cycles trying to convince a crowd that they are wrong, they just do what they know to be right and are willing to let the chips fall where they may. “Plant your own garden and decorate your own soul, instead of waiting for someone to bring you flowers,” would be the quote mentally strong people would adhere to. Veronica Shoffstall is right. You have to grow your own garden because nobody promised you a bed of roses. Mentally strong people understand that you have to, “Build your own dreams, or someone else will hire you to build theirs,” as Farrah Gray advises. For, “There is only one success - to be able to spend your life in your own way, and not to give others absurd maddening claims upon it.” Mentally strong people understand the wisdom of Christopher Morley and seize on the fact that their success is dependent on themselves, not someone else. Ben Franklin once said, “Energy and persistence conquer all things.” Mentally strong people understand that this staying power allows us as individuals to pursue and conquer our goals. Oprah Winfrey adds to this by saying, “Sometimes faith is knowing that you will make it through. It's believing in abundance and your own worthiness.” That staying power will in the end gives you that abundance you desire. There is a quote I use often when talking to fellow entrepreneurs, “Nothing in the world can take the place of Persistence. The desire and ability to press on has and always will solve the problems of the human race and divide those who achieve from those who might have been.” Mentally strong people want to solve those problems. “If you have integrity, nothing else matters. If you don't have integrity, nothing else matters.” Alan K. Simpson’s quote goes right to the heart of what mentally strong people believe and adhere to. Without integrity, we are nothing. While integrity is the linchpin of mentally strong people’s belief system, they also realize a strength in Cecil Beaton’s quote, “Be daring, be different, be impractical, be anything that will assert integrity of purpose and imaginative vision against the play-it-safers, the creatures of the commonplace, the slaves of the ordinary.” This quote goes with mentally strong people ability to take and accept risk. Mentally strong individuals expend their time and energies in improving and refining the one thing they have any control over, themselves. “Let the refining and improving of your own life keep you so busy that you have little time to criticize others,” saliently states H. Jackson Brown in this quote. Mentally strong people are always too busy with self improvement to really care about trying to change things they have no power to change. Johann von Goethe once said, “To think is easy. To act is hard. But the hardest thing in the world is to act in accordance with your thinking.” Mentally strong people are able to do this and realize as the proverb states, “Every man is the architect of his own fortune.” Thinking productively is not done in a vacuum, but in the furnace of life's experiences. “Discovery consists of seeing what everybody else has seen and thinking what nobody has thought.” Albert Szent Gyorgyi is actually calling out a mentally strong person’s ability to use productive thinking to see those things that are invisible to others. No one likes criticism, hardship, or adversity. Then again, no one said life was easy. Mentally strong individuals realize what Ben Jonson states in, “He knows not his own strength that has not met adversity.” It is through hardship, that the mettle of a person is forged. And, “Hardship often prepares an ordinary person for an extraordinary destiny,” as C.S. Lewis states. This is a core tenet of being mentally strong. These types also understand as Franklin wrote, “Any fool can criticize, condemn and complain, and most fools do.” They avoid the downside of blaming others and get through the discomfort. In addition, being mentally strong also involves a bit of humility and the ability to remember where you came from. Bill Gates states, “It's fine to celebrate success, but it is more important to heed the lessons of failure.” Being mentally strong means realizing that success is a process, and with time and effort, all things are possible.